A new exhibition at After Nyne Gallery plunges the viewer into an experience that is all at once familiar and exotic. 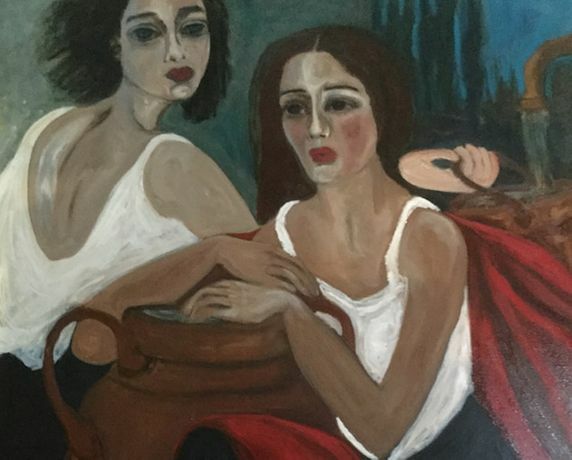 The exhibition, entitled Recollections of Things Past, is a collection of works by Dr Dina El-Sioufi whose work features in private collections in Egypt, France, Kuwait and the United Kingdom. ‘Dina’s work has the power to transport the viewer into places that are both of and beyond the world we recognise. There is a fundamental humanity in these works that crackles with atmosphere and recognition. But there is also something ephemeral about them, something that transcends physicality and becomes profoundly spiritual. Even on a physical level these are elegant paintings that stand up to repeat viewings. Dina El-Sioufi was born in Alexandria, and grew up in London. She gained a BSc in Physics & a Post Graduate Diploma in Mathematical Physics (Kings College, London University in 1989), an MA in Modern French Studies (Birkbeck, London University, 2000) and a PhD (UCL, London University, 2006). After her PhD, she turned her attentions to painting and attended courses at the Slade Summer School, Heatherleys, the Royal Drawing School and in Lyon.